TC Mag got its hands on a photo of the upcoming EVGA X79 FTW mainboard. This LGA2011 board uses the EATX form factor and features 100% POSCAP capacitors, four DDR3 slots, two SATA 6Gbps ports, four SATA 3Gbps ports, and five PCIe x16 slots. 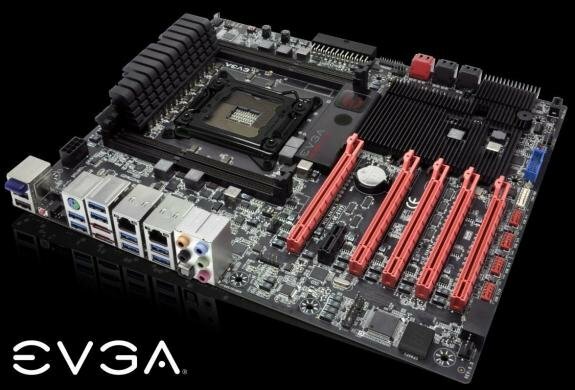 EVGA's board also boasts a right-angled 24-pin power connector, PCIe and DIMM disable switches, ten USB 3.0 ports (eight on the back panel, two more via a header), dual Gigabit Ethernet, two eSATA connectors, 7.1 channel audio, Bluetooth, a debut LED, an EVBot port and UEFI BIOS. The X79 FTW is expected to ship next month.